One of the best ways to architect an application is by separating the user interface from the underlying code, which is sometimes called the business logic. Several techniques exist, but the one that is tailored for XAML-based environments is known as Model-View-ViewModel or MVVM. In many smaller programs (and even larger ones), often the Model is absent or its functionality is integrated into the ViewModel. The INotifyPropertyChanged interface declares a single event named PropertyChanged that indicates the property that has changed. The DateTimeViewModel in the Xamarin.FormsBook.Toolkit library defines a property of type DateTime that changes based on a timer. The class implements INotifyPropertyChanged and fires the PropertyChanged event whenever the DateTime property changes. The MvvmClock sample instantiates this ViewModel and uses data bindings to the ViewModel to display updated date and time information. Properties in a ViewModel can be more interactive, as demonstrated by the SimpleMultiplierViewModel class, which is part of the SimpleMultiplier sample. The data bindings provide multiplicand and multiplier values from two Slider elements and display the product with a Label. However, you can make extensive changes to this user interface in XAML with no consequent changes to the ViewModel or the code-behind file. The code in ViewModels can be streamlined by defining an OnPropertyChanged method using the CallerMemberName attribute, which obtains the calling property name automatically. The ViewModelBase class in the Xamarin.FormsBook.Toolkit library does this and provides a base class for ViewModels. MVVM works with data bindings, and data bindings work with properties, so MVVM seems to be deficient when it comes to handling a Clicked event of a Button or a Tapped event of a TapGestureRecognizer. 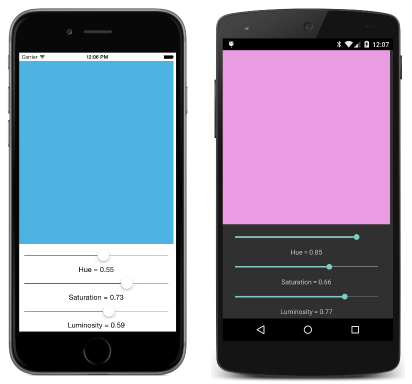 To allow ViewModels to handle such events, Xamarin.Forms supports the command interface. Internally, a ViewModel sets each property of type ICommand to an instance of a class that implements the ICommand interface. Through the data binding, the Button initially calls the CanExecute method, and disables itself if the method returns false. It also sets a handler for the CanExecuteChanged event and calls CanExecute whenever that event is fired. If the Button is enabled, it calls the Execute method whenever the Button is clicked. You might have some ViewModels that predate Xamarin.Forms, and these might already support the command interface. For new ViewModels intended to be used only with Xamarin.Forms, Xamarin.Forms supplies a Command class and a Command<T> class that implement the ICommand interface. The generic type is the type of the argument to the Execute and CanExecute methods. The PowersOfThree sample demonstrates how to use the command interface in a ViewModel. The PowersViewModel class defines two properties of type ICommand and also defines two private properties that it passes to the simplest Command constructor. The program contains data bindings from this ViewModel to the Command properties of two Button elements. The Button elements can be easily replaced with TapGestureRecognizer objects in XAML with no code changes. The AddingMachine sample makes use of both the Execute and CanExecute methods of ICommand. It uses an AdderViewModel class in the Xamarin.FormsBook.Toolkit library. The ViewModel contains six properties of type ICommand. These are initialized from the Command constructor and Command constructor of Command and the Command<T> constructor of Command<T>. The numeric keys of the adding machine are all bound to the property that is initialized with Command<T>, and a string argument to Execute and CanExecute identifies the particular key. The AdderViewModel used in the AddingMachine sample also defines two methods named SaveState and RestoreState. These methods are called from the application when it goes to sleep and when it starts up again.